I’ve toyed with the idea of making an agua fresca for a little while. What with the focus on Brazil and South America at the moment with the Olympics I have seen a few frescas popping up on menus. But I wondered, is it worth the effort, isn’t it just easier to squeeze a bit of fruit then water it down? Well yes, but it turns out it’s just not the same. And the (what might seem an unnecessary step but take my word for it it’s definitely needed) sieving does save you from any surprise seeds making into your final beverage. I had a couple of grapefruits loitering round in my fruit bowl and thought it was now or never. So, welcome to my Grapefruit, Lime and Basil Agua Fresca. Peel the grapefruits and lime and add to a food processor with the basil and sugar then blend to make a smooth puree. Pass the puree through a sieve into two glasses then top up with sparkling water. If you’re feeling fancy, add a bit of lime peel to each glass. It’s by no means a complicated recipe but considering how simple it is it does generate a fair amount of washing up! 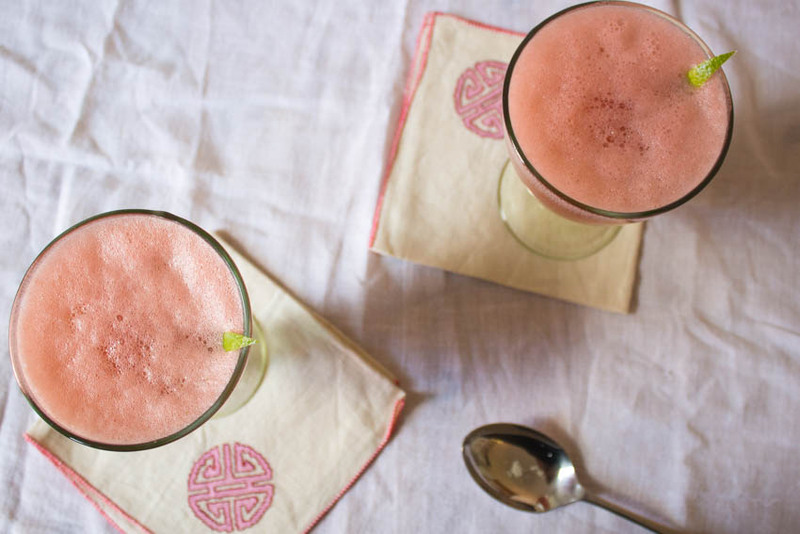 It’s super refreshing and a great way to use up a few pieces of fruit that you have left over. 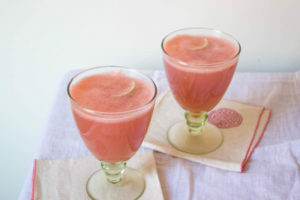 I loved the pink colour of the drink and that you could see teeny tiny pieces of basil floating in the glass, the grapefruit, lime and basil worked really nicely together and made for something different to drink which will see me all through the summer. You could try this with all sorts of other fruits and herbs; I’m thinking pineapple and mint or watermelon and lavender would be amazing. What a wonderful color! Bet the flavor is awesome, too. Fun recipe — thanks so much! This looks nice and refreshing! Oops- could I be forgiven to add a dash of white wine to this recipe? I have never thought of adding fruit to my sparkling water…it must be very good! Looks like a refreshing drink Caroline, love the color! I like this refreshing and delicious drink. Perfect for these summer days! I love that you picked a grapefruit one…love the color and definitely looks and sounds refreshing. Glad you tried it…I’ve been curious myself, too! Wow that looks so refreshing, it is so hot here. And love the flavors and color. Will have to try!